Recyclebins labeled according to types of waste in a Britain school. 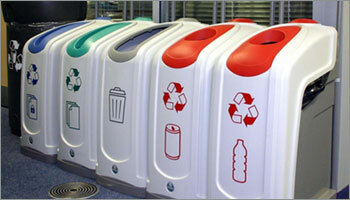 British parliament has given its nod to the new packaging recycling targets for the period 2013 to 2017. The targets are now set to become law in January. British MPs Wednesday backed the targets after a debate in Second Delegated Legislation Committee that examined the Draft Producer Responsibility Obligations (Packaging Waste) (Amendment) Regulations 2012. The new law will raise the target for plastic recycling from 32 per cent in 2012 to 57 by 2017. The new packaging regulations are designed to meet and exceed the minimum 60 per cent recovery target set by the European Union Packaging and Packaging Waste Directive 2009. In 2010, Britain achieved a 67.3 per cent recovery and recycling rate, and by 2017 this must reach 72.7 per cent according to the new regulations. During the debate, Environment Minister Richard Benyon said: “Overall, we estimate entire package of targets will bring a net benefit of £181 million to the UK economy over the period 2013 to 2017. “Most of the anticipated benefits, over 95 per cent, will come from revenue generated from recycled materials…" Benyon added. The directives will automatically mean a boost for the plastic recycling industry in Britain, which will have to up its processing and expand, in order to meet the new targets. These developments also mean the requirement for high quality additives for plastic recycling would also see an upswing. Recycling being a difficult process, these additives are used extensively by British recyclers. Vin Polymer Additives' RecycloAid is one such additive. RecycloAid ensures optimum dispersion of polymers and complete removal of moisture from recycled plastics, ensuring better, stronger products.